Being safe and comfortable around water is extremely important, and it's never too early to introduce little ones to the basics of water skills. Many infants actually take naturally to the water! Infant swim classes in Marin County start as early as six months old, and are usually parent/child sessions where you or a caregiver can enjoy the water with your child. While most of these classes don't teach infants to swim per se, they do introduce parents and children to the water and important safety skills. Below is our list of infant and toddler swim classes in Marin. Although many of the facilities listed are private clubs, unless otherwise indicated, all locations offer public lessons open to all. Most programs require pre-registration; follow the links or call to sign up or for more information. Survival swimming lessons for children ages 6 months–6 years. Lessons for a 6–12-month-old focus on teaching the child to roll onto their back to float, rest and breathe, and to be able to maintain this life-saving position until help arrives. Lessons for children 1-6 years old focus on teaching the swim- float-swim survival sequence. The Mill Valley Swim School offers classes for ages 6–36 months. They offer private, group, and group private lessons. Both classes introduce little ones to the water with parent participation. Strawberry's Seedlings Program is a parent/child water orientation class for ages 6 months–3.5 years old. Through songs, games, and safety skills children learn to enjoy the water with their parent. Children are not expected to learn to swim in this class. Tiny Turtles provides an early introduction to swimming for ages 8 months–3 years. The course is directed towards improving the child’s comfort level in water while training parents in water safety and drowning prevention. Parents are taught how to work with their own child on water adjustment and basic swimming skills. One parent or guardian must be in the water with each child. Swim Diapers required. SwimAmerica offers swimming to kids of all ages. They also offer an Aqua Babies program is for infants 6 months–3 years in Petaluma only. Infants do not learn to "swim" but become comfortable with the water, float on their backs, and get a breath of air. Survival swimming lessons for children ages 6 months - 6 years. Lessons for a 6-12 month old focus on teaching the child to roll onto their back to float, rest and breathe, and to be able to maintain this life-saving position until help arrives. Lessons for children 1-6 years old focus on teaching the swim- float-swim survival sequence. 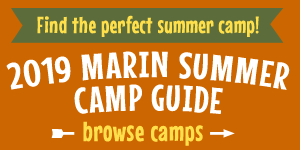 Marin YMCA offers parent/child swim classes for ages 6 months–3 years. Classes provide a fun and inviting environment for babies and toddlers through the use of toys, songs, and companionship with other similarly aged participants. Children become aware of the differences between dry land and water and parents learn how to keep their child safe in and around the pool. The child must be accompanied by a responsible adult in the water. The Osher Main JCC's aquatics program offers Baby Swim classes for children 6 months–4 years old. Classes include Mommies in Motion, which gives moms a great aerobic workout and introduces baby to water skills (9–36 months). Splash! (9–24 months) and Advanced Splash! (2–4 years) introduce children to water play and water exploration.